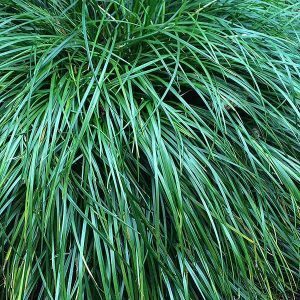 If you are looking for an easy care plant for a shaded area, ornamental grasses may be the solution. Although shade can be a difficult part of the garden to grow plants.A number of grass like plants grow well beneath trees and in the shadows of buildings. 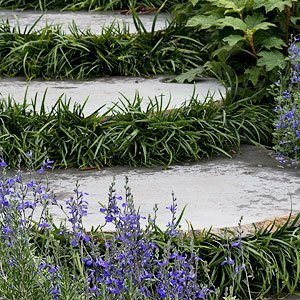 We look at some of the best ornamental grasses for both dry and damp shade. This is a very attractive plant with lime green and yellow arching foliage. It grows well in part shade, however it does need some moisture. Also suited to growing in containers. Use it as an edging plant. If we had to choose one grass for dry shade, this would be it. 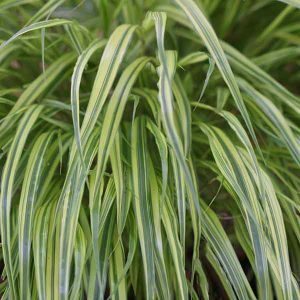 Very attractive evergreen foliage, grows well in dry shade and requires little to no maintenance. Its not invasive and looks great all year round. It also looks great in a container. Care – Very low care. The other Liriopes are all good in dry shade, some with flowers, some with variegated foliage, however ‘Emerald Cascade’ just beats them for us. Taller growing to around 1 metre, attractive seed heads, however it will self seed. So be careful where you plant it. Variable in height from 10 cm to 1metre. Look for the clump forming varieties unless you have the space. Many species grow well in moist and even wet soil. Clump forming and reaches from 70 cm to 1m in height. It does prefer moist soils. Care – Needs to be cut back each year. This is a native grass that does well in light shade, slow growing and not the best in very dry soils. Spread – Will slowly spread to form a large clump.